A great Home Studio addition and one of staples of my Home Studio has been this little gem! This my friends is the Boss Br-800 and it is loaded with goodies! On top of being able to jam with your headphones for late night sessions you also get to turn that guitar into a bass, and many other things, to numerous to mention. I have been able to use this to take a song from start to finish all the way through the Mastering process with this bad boy! 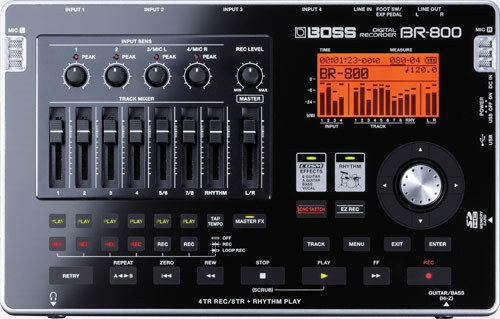 Included within the Boss Br-800 is a huge variety of completely customizable presets for vocals, guitar, bass, and even some excellent drum patterns. The drum patterns contained within are also customizable with the included drum map manager. As if that wasn't enough, there is an LE version of the Cakewalk Sonar Music Production Software ! Literally, I brought this thing home, plugged it in and produced a song in under 4 hours! A one man bands dream come true! I was able to pick a drum track, lay down my guitar, put a bass track behind it, and perform the solo guitar after that. Throw in some great sounding vocal effects and ta-da! If you are in the market for an excellent audio interface that can take your recordings to the next level, and especially if you are a solo artist, the Boss Br-800 is for you! Here are the specs below. Happy recording!